Lorenza De'Medici offers a banquet of antipasti! Antipasti are among the most flexible and attractive offerings from the Italian table. Usually light and healthful, often easy to prepare, and always flavorful, these small Italian dishes are perfect for the way Americans eat today. But as contemporary as they seem, these little dishes are actually quite ancient. 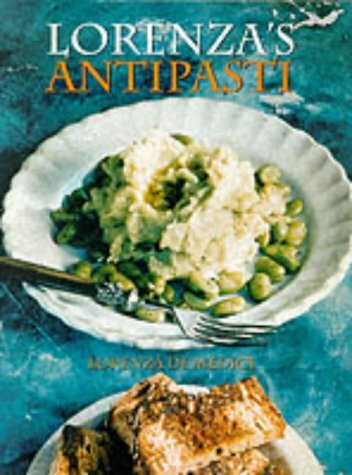 In Lorenza's Antipasti, Lorenza de'Medici, one of the world's great Italian cooks and food writers, brings us the whole story of antipasti. Antipasti are traditionally, and most familiarly, served as appetizers. A selection of bocconcini, tartine, or pizze are served with an aperitivo glass of wine as guests arrive for dinner. But in more than 200 recipes, Lorenza also demonstrates how, served in innovative ways, a single antipasti dish can become a meal in itself. Something as simple as Crostini with Mozzarella can be an impromptu snack. A more elegant antipasti like Fig and Goat's Cheese Tart makes a delicious light lunch for entertaining. More substa! ! ntial dishes—Pasta and Tomato Timbal or Frittata Cannelloni with Ham and Provolone Cheese—make a satisfying dinner. The variety of antipasti is extraordinary, incorporating every food and flavor from raw vegetables and preserved meats to pâtés and focaccia, to healthy vegetarian and seafood preparations. Lorenza's recipes range from simple, authentic favorites such as Pinzimonio (vegetables dipped in olive oil) to more elaborate creations, including Zucchini filled with Porcini Mushrooms or Truffles with Pancetta. Illustrated with Gus Filgate's prize-winning photography, Lorenza's Antipasti continues the culinary journey of its predecessor, Lorenza's Pasta, to create a sumptuous celebration of Italian cuisine. LORENZA DE'MEDICI was born and educated in Milan. She began her career as food editor on Vogue Italia and has since written over twenty books, including the best-selling The Renaissance of Italian Cooking and the James Beard Award-winning Lorenza's Pasta, the com! ! panion to this volume. Lorenza and her husband, Piero Stuc! chi-Prinetti, spend most of their time at their home, Badia a Coltibuono, an eleventh-century monastery, estate, and winery in Tuscany. From there, Lorenza manages her prestigious cooking school, and teaches her distinctive culinary arts in English. GUS FILGATE is one of Great Britain's most innovative and creative food photographers. He won the James Beard Photography Award for his beautiful photography in Lorenza's Pasta. He lives and works in London.